I need to get wire-antenna supports up into some tall pines at a remote location, and the slingshot that I would normally use to do this is at my brother's house. So...in its absence I thought I'd instead make a "pneumatic antenna launcher" to help me get the supports up into high tree branches. 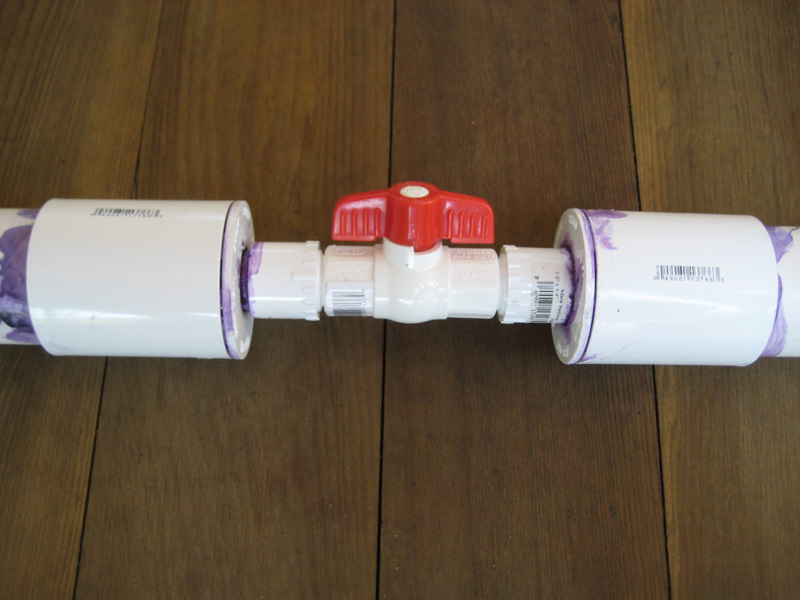 A quick Google search revealed a number of plans for pneumatic antenna launchers, the most common using 2.5" PVC pipe. Although these designs were usually pretty fancy (using adapted sprinkler valves to trigger the launchers), I thought they might form the basis of a simpler design that I could quickly assemble. So off to Home Depot I went to pick up some 2.5" PVC and accessories. Unfortunately, when I arrived I discovered that the local Home Depot only has Schedule 40 PVC pipe up to 2" inner-diameter, but not 2.5" pipe. Well, why not use 2" pipe? With this diameter in mind, I searched through the bins of various PVC couplings and parts, designing the launcher in my head as I discovered what bits and pieces Home Depot had in stock. The air-chamber and barrel are made from 2" I.D. Schedule 40 PVC pipe. Overall length is 90 inches. The barrel is 32 inches long, and the air-chamber is 52 inches long (roughly 2.5 quarts in volume). I chose 2.5 quarts as a compromise between air-volume and length of the chamber. Other designs that I found on the internet seemed to use a volume of about 3 quarts for their air chambers, but, with 2" PVC pipe, this would require a chamber length of 60 inches, which I thought would make the overall launcher a bit too unwieldy. So I shortened it up a bit, which, for me, puts the "trigger" at a nice height when the end of the launcher is resting on the ground. For the "trigger," rather than try adapting an expensive sprinkler valve as others had done, I went with a low-tech, low-cost ball valve which I'd seen used in the following photo of a potato launcher. The 1/2" ball-valve is threaded at both ends. To connect it to both the 2" air-chamber and the barrel, I screwed into each end of the valve 1/2" (threaded) to 3/4" (female slip) adapters (with a generous amount of Teflon pipe-tape on the threads), and then I glued short lengths of 3/4" PVC pipe into the slip-joint ends of these adapters. In turn the other ends of these short lengths of 3/4" pipe are glued into 3/4" (slip) to 2" adapters. The barrel and the air-chamber connect to these 2" adapters via 2" slip couplings (again, glued). Note that the threaded couplings allow the launcher to be disassembled for easier transport. And, should I ever decide to change to a fancier trigger mechanism, they would allow me to easily swap out the original ball-valve trigger for something different. To fill the air-chamber I used a Presta valve from an old bicycle inner-tube that I had lying around. It's threaded and has a nut, which eases its installation. A Schrader valve would have been preferred, as Presta valves are a bit fragile, but the Presta valve was what I had on hand. To ensure a good seal between the valve and the air-chamber pipe, I cut out two pieces of the bicycle inner-tube rubber, each piece roughly a circle 1" in diameter. Into the center of each piece of rubber I cut a small hole slightly smaller than the diameter of the Presta valve. I pressed these each over the valve and worked them, one at a time, down the stem to the end that would be within the air-chamber pipe. I drilled a small hole in the pipe just past the point where the end-cap would stop (do NOT attach the end-cap yet before you install the valve! ), and then I inserted the valve into this hole. With its nut tightened down, the rubber "gaskets" I'd made provided a good seal against the inside of the air-chamber. 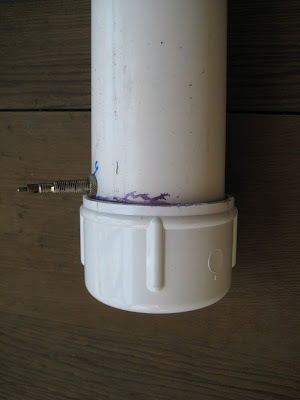 After I'd installed the valve, the air-chamber was capped off with a 2" PVC cap, glued in place. Because the pipe is only 2" in diameter, I couldn't use normal size tennis balls. A visit to Jon, K6JEK, and his wife revealed exactly what I needed. Their dog Buster likes to chase 2" tennis balls. 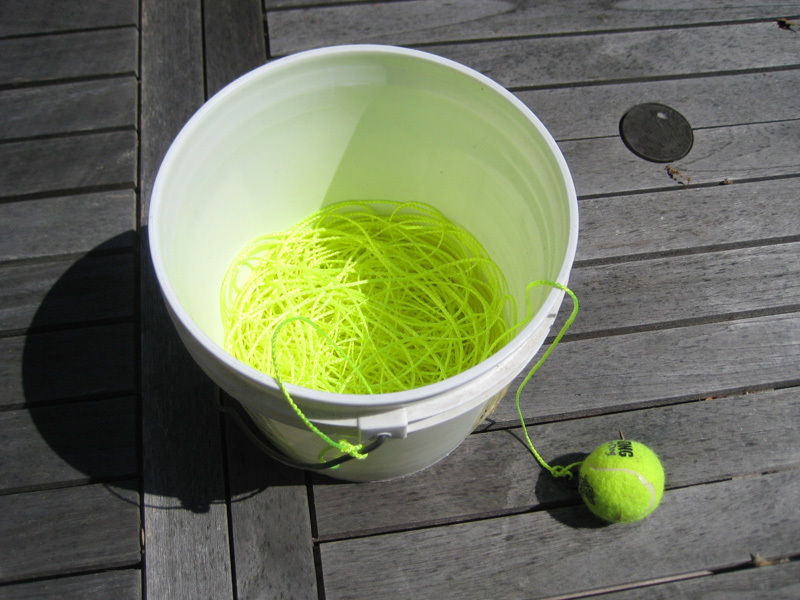 I tested one of these tennis balls in the launcher, and it worked great! Buster was too attached to his tennis ball for me to try to take it (and his others were chewed beyond recognition), so it was off to the local Petco (pet supply) store to search for more 2" tennis balls! The yellow balls are a bit softer than the blue/pink ball, and they are "squeaky" toys. I drilled a couple of holes in one so that I could insert a tie-wrap to use as an attachment loop. Then, at the other end, I cut a thin slit with an X-acto knife so that I could insert pennies to add weight. Per another website, the ball should weigh between 4 and 5 ounces (as the best tradeoff of height, safety, and the ability to pull the line down over tree branches and foliage). Getting it up to 5 ounces pretty much fills up a 2" tennis ball with pennies! (Each penny is roughly 0.1 ounces). Using a bicycle tire-pump, I've tested my chamber up to about 80 psi and it seemed to hold its pressure fine (at least for the time it took me to insert a ball and launch it). The 2" pipe itself is rated to 280 psi (and the 3/4" pipe to 480 psi), but the ball-valve is only rated to 150 psi. I'd recommend keeping the max pressure well below this point, though. A small paint bucket can be used to hold the line and keep it from becoming entangled in ground debris (e.g. twigs and leaves). Tie one end of the line to the bucket handle! (Note: I only tested once at each psi level. Heights are approximate, based on a rough measure of how much line played out). While erecting my 80 meter full-wave loop, I discovered that I needed the ball to be heavy so that, if it were in an environment with many branches, it had a better chance of pulling down the line attached to it. I had started with a 4 oz. tennis-ball load, but finally decided I was better off with the ball loaded with as many pennies as I could fit into it. The result is a ball which weighs about 5.5 oz. Even at this weight, sometimes the ball wouldn't drop all the way to the ground, and I would have to "finesse" it down by wiggling the line or trying other tricks. And sometimes I just had to pull the ball back and start over again. Perhaps a more "slippery" line might have helped the ball descend, but in the end I was able to get all of the supports up and the loop raised without either having the ball become permanently stuck in a tree, or my having to run to the store to purchase yet one more thing. 1. Mechanically, the weakest point is the smaller-diameter pipes and adapters that make up the trigger mechanism: this is where you'll see the launcher bending. To protect these parts when transporting or storing the launcher, I'd recommend unscrewing the barrel from the ball-valve, and not unscrewing the air-chamber. Keep the air-chamber screwed into the ball-valve, because it's important to maintain a good air-tight seal at the threads to prevent pressure loss. 2. More height-per-psi might be achievable with a better (faster) trigger mechanism (e.g. adapted sprinkler valve), but I'm satisfied with my results -- they work for my application, and the design is very simple and easy to construct. Also, because the tennis ball is narrower than 2", air can escape around it as it's moving through the barrel. Some sort of circular disk to minimize escaped air (say, made out of an old mouse pad?) first placed at the bottom of the barrel with the ball then inserted so that it's lying on top of it might improve performance. But in the end I've decided that all I really need to do is add a few more psi with my bike pump to get the heights I need. If you build one of these, use common sense and, above all, use at your own risk! Follow instructions for gluing PVC, allow adequate curing time, and, when finished, don't overstress the PVC by pumping in too much air! 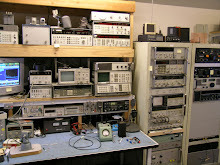 Very interesting post.Glad to visit your blog. Built one of these and it works great. I used an old sock filled wtih dirt as the weight and pushed it home with a stick. 35 psi in the tank sent it up 50 to 60 feet. Thanks. Looking into to tennis ball launchers for my antenna and found your blog. It looks like what you are saying is that you used 2 in. PVC for a tennis ball - which is 2 1/2 inches in diameter. Is that right? I hope so, as I am also having trouble finding 2 1/2 in. PVC. 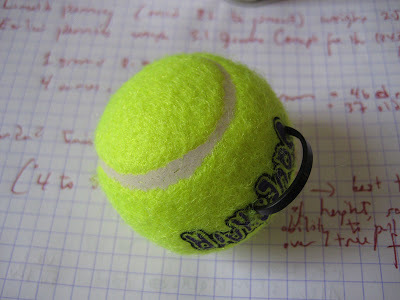 Right -- I used 2" PVC, and this size is too small for normal tennis balls. 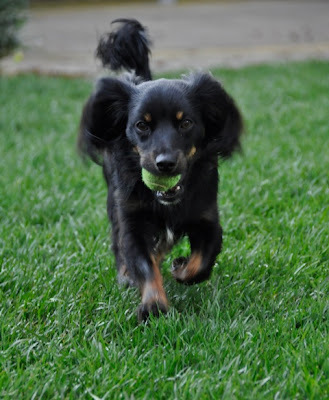 However, I found smaller "tennis" balls at a pet supply store, and they worked fine. Please note the earlier comment from someone who used a dirt-filled sock. This sounds like a simple way to make a launch projectile, in lieu of hunting up the smaller tennis balls. Thanks Jeff for the reply. I dunno, I must have been behind on me coffee quota when I first read your article. You clearly spelled it out, I just missed it. Again thanks for the article. 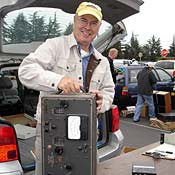 Now that the WX has turned bad, and an impending snow storm, I say condx are abt right to put up an antenna - 73 es tnx agn! "because the tennis ball is narrower than 2", air can escape around it as it's moving through the barrel"
Maybe putting a sock around the ball, or some thin, stretchable material would make a slightly tighter fit, enabling greater height. Also, what type of line did you use? Might heavy (50 lb) fishing line work better since it's more slippery? Maybe with a reel attached to the side? Thanks for the simple design! How much noise does this make when launching? I don't recall the type of line, off hand, but I picked it up at the hardware store. Thanks for this! I built one but folded it at the valve to make it shorter (u - shaped). 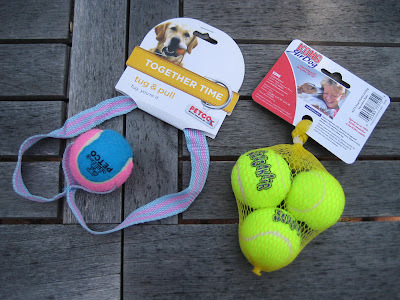 Found some "Martha Stewart" brand balls for pets at Petco thare a perfect for 2" pvc. A pack of 4 balls was $3. I put up an OCF dipole and this was fun! The ball settles at the bottom of the 2" tube.